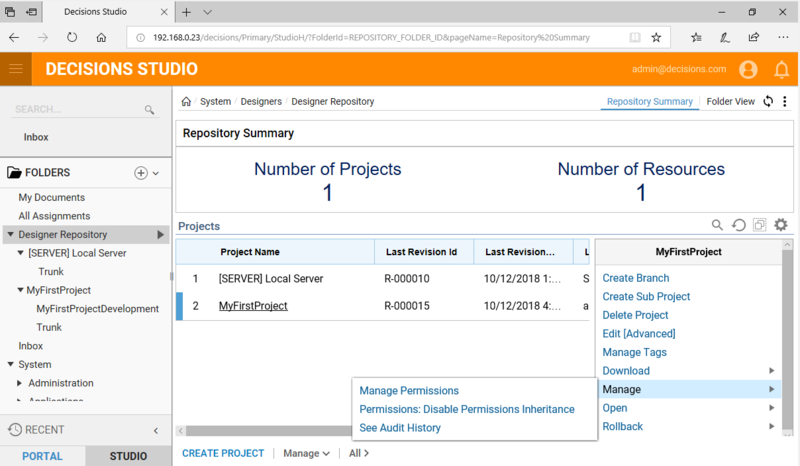 Now that there is a Repository Server, being working with Projects and begin utilizing the Repository features & functions. This example will walk through creating a project and learning what can be achieved via the Repository. In the Designer	Studio	, navigate to the Designer	Repository	folder. 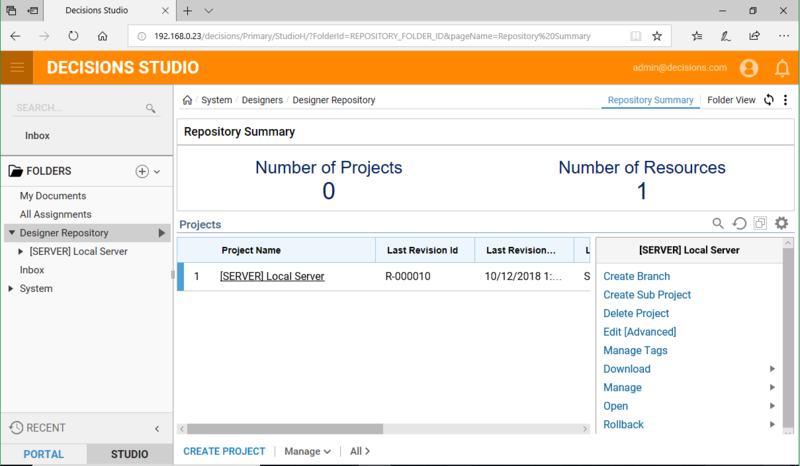 Here a Dashboard shows created and existing Projects. There is also the ability to create a new Project by selecting Create	Project	button in this folder. Now the setup and configuration for the first Project begins. 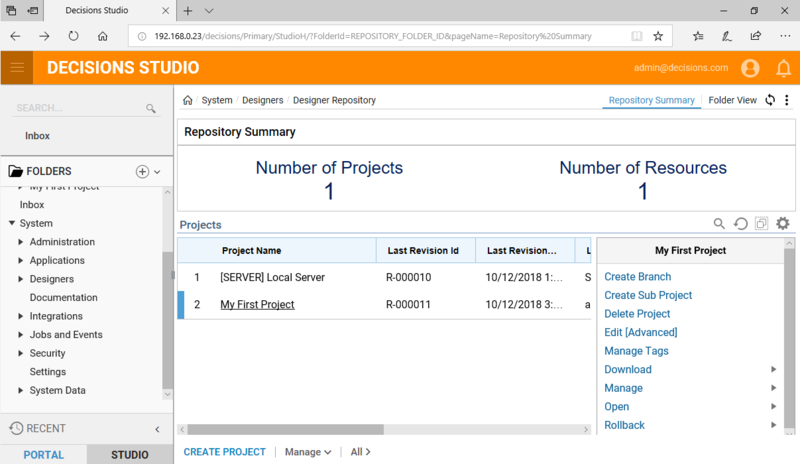 In the resulting window, Name	the Project	and give it a Description	then select Create. The new Project	now appears in the Designer Repository Folder. 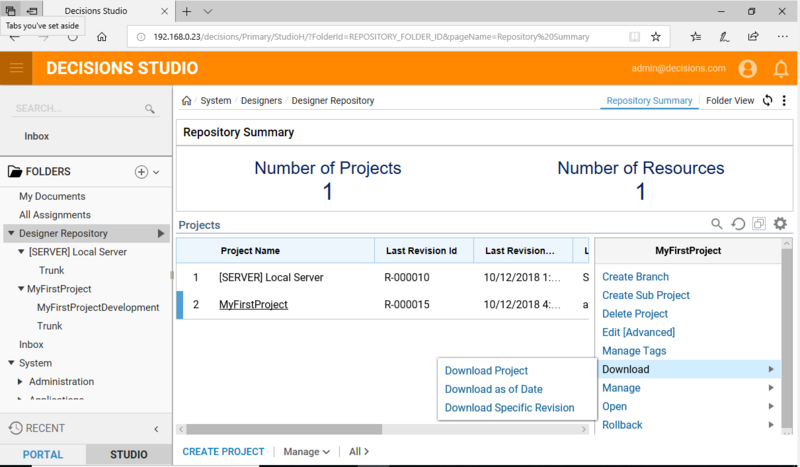 In this example the project is named MyFirstProject. Counters	on the top of the Dashboard are calculating total Number of Projects	and Number of Resources	. On the right-hand panel are the available Options	for the selected Project	. 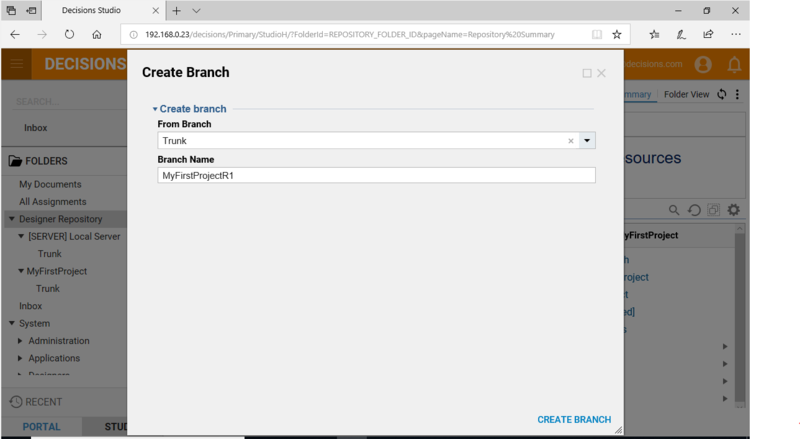 Create a new Branch by selecting the Create Branch option from the right hand side panel. A dialog appears asking to Name the Branch and select where the branch is from. In this case, select Trunk. Name the Branch MyFirstProjectR1. A Development build version of the Project has been created, which is independent of the Trunk. The new Branch also shows up under the Main Project. Creating Sub Projects under the main Project: This is useful when specific components of one project may need to be used in another, create a Global Project which hosts the Entities that can be shared and then linked corresponding Sub Projects to it which will have access to the shared entities. To create a Sub Project, select the Create	Sub	Project	option from the right hand side panel. 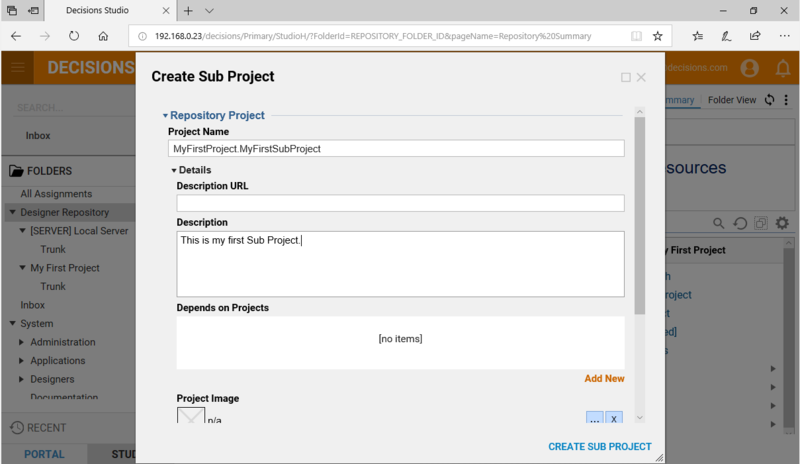 A dialog opens asking to Name	the Sub Project and give it a Description. Select Create Sub Project	. Any Projects can be deleted. Do so by selecting the Delete Project option from the right hand side panel. A dialog box will appear prompting confirmation. Users can also download a project to store it for later use or as a backup copy to restore back to. Do so by selecting the Download option from the right hand side panel and clicking Download. A dialog appears to chose which project or version to download. 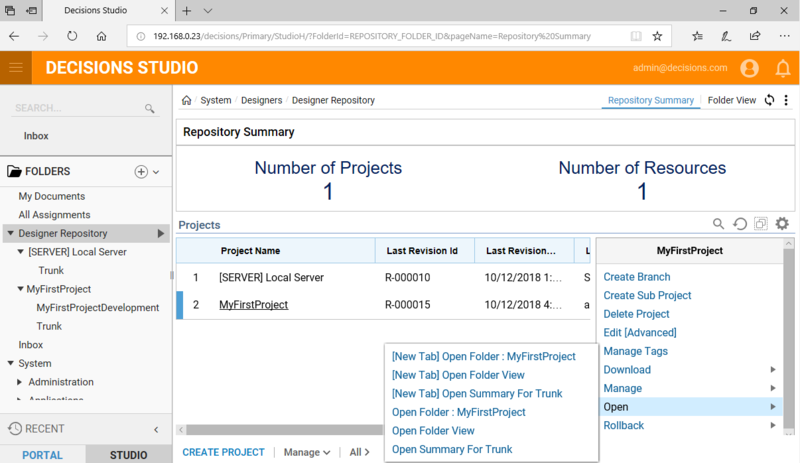 Select MyFirstProjectR1in this example to download the Developer version of our Project. This starts the download process and you should receive a browser notification prompting you to save the .zip file which contains our Project. From here the .zip file is able to be saved wherever you like and now acts as a saved version of the project that can be referenced/rolled back to at any point. Under the Manage options we can manage the Permissions related to the Project. Here we can give different User groups access to the Project, we can disable the Permissions Inheritance or See Audit History of the Project. Under the Open options we have a few different ways to open & view the Project. 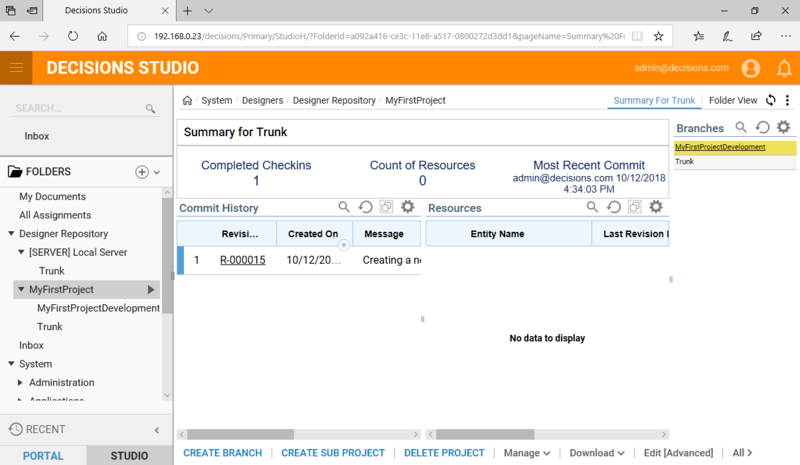 We are able to Open The Folder View, Open the Project Folder itself, or Open Summary For Trunk. The last action we can do is the Rollback action. 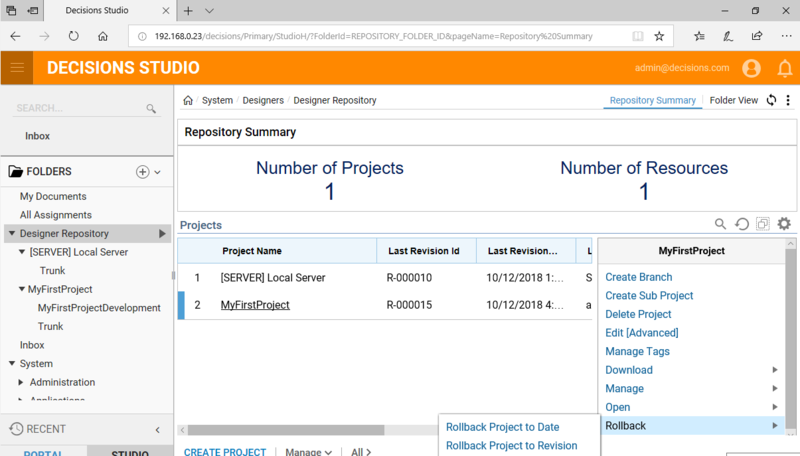 From here we have 2 choices, we can either Rollback to a specific Revision (version) of the project, or Rollback to whatever state the Project was at a given moment in time. Every time there is a change to the Project a new Revision (state of the Project) is created, meaning we can Rollback	to it at any time to the desirable past state.